Hit refresh often, I'll be updating this posting throughout the morning. See my other posts today for specific announcements and news.... Note that the live-blog process will reset the comment counter occasionally. I apologize in advance. The band is rockin', the cameras are clickin', the wireless is IN THE HOUSE! 7:52 AM A shoutout to Colleen Campbell, Lotus Marketing program director, sitting next to me here in the second row while Sandra Marcus is dancing in front of me! Is this a conference or a party?!?! 8:06 AM Mike Rhodin onstage. 9% revenue growth for Lotus in 2007. 8:27 AM Mike Rhodin has returned. "The makeup of the workforce itself is undergoing profound changes". 97% of employees do not work in corporate headquarters. 8:50 AM Jeff discusses Traveler and other mobile innovations in Notes/Domino 8.0.1. Mentions DWA "lite" mode and DWA support on the iPhone. 8:51 AM Jeff announces public beta of Notes 8.5 on the Mac. 8:52 AM Russ Holden counterpunches with 35% storage reduction in Domino 8.0.1. Improvements mean Domino Web Access can be delivered, according to IBM CIO office, for US$4 per user per month. 8:55 AM Ron Sebastian is demonstrating My Widgets support in Notes 8.0.1, including Google gadgets in the Notes client. 8:59 AM Ron is showing Domino Web Access 8.0.1 including the new "lite" mode, which is being used in Lotusphere Online. 9:05 AM Maureen Leland comes out to demonstrate Domino Designer 8.5. New, modern user interface for Domino applications. Updated Domino discussion database, using xPages design elements. Biggest applause so far -- Class browser for Lotuscript code. 9:10 AM Kevin Cavanaugh, VP Messaging and Collaboration. 400,000 downloads of Lotus Symphony. Beta update for Symphony coming in February that includes the full Lotus Expeditor environment and Symphony APIs. Applications developed in Symphony will also run in Notes. 9:14 AM Bruce Morse, VP Unified Commuincations. Celebrates 10th anniversary of Sametime (great marketing idea, Adam!). "First 'fit-for-business'" product. In 2007, 1/3rd of new Sametime customers use Outlook. Over 100 million users entitled to Lotus Sametime. 9:17 AM If you want a sneak peek at upcoming news, the press release covering Lotus's SMB market plans is now live on ibm.com. 9:20 AM Bruce is discussing the Sametime product family including upcoming Sametime Advanced and Sametime Telephony. Be sure to attend his keynote tomorrow morning for more news. 9:24 AM I missed an announcement! Jeff Eisen disclosed the plan to support Notes on Ubuntu. Huge news! 9:28 AM Larry Bowden, VP WebSphere Portal now on stage. #1 market share for Portal. "This is good, but we thought we could do more". Seven new accelerators for WebSphere Portal. Agreements with Sungard and GoPro. 9:39 AM Jeff Schick, VP Lotus Connections on stage. In the past, a company's directory was used to find a name or phone number. 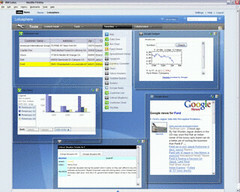 Social software transforms the directory to an "expert profile platform". 9:43 AM Shipping Quickr 8.1 in March. New capabilities, especially to Notes and Domino customers. "There's never been a better way to share your personal files." Integration to Notes 8, Symphony, Outlook. Later this year, integration into FileNet P8 and IBM Content Manager. Open connector framework for Quickr. Suzanne Minassian demos Filenet integration. 9:50 AM Jeff moves on to Connections. Next release will support many worldwide languages including Arabic and Russian, and add language translation services to Connections. Integrated to Yahoo! Answers. Ability to link to Facebook. Integrated with wikis such as Socialtext and Confluence. Reading Ross Mayfield's live blog, he's here at Lotusphere. 9:54 AM Suzanne demonstrating integration between Connections and Quickr. Shows Connections client on RIM Blackberry. Valerie Wang showed me this the other night, very cool stuff. 9:59 AM Funny on Paul Mooney's blog: "Everytime Ron Sebastian comes to stage, everyone shout his name like "Norm" from Cheers......"
10:00 AM Jeff announces Lotus Mashups, new product for building Mashups for any environment, including widgets from anywhere including Domino, Quickr, etc. 10:04 AM Nelson asked about Domino Document Manager -- probably not mentioned here but there is breakout ID511 on Wednesday at 3 PM. 10:05 AM Rhodin is back. We're not done yet. SMB announcements coming. MAJOR expansion of marketing strategy for IBM to reach small and medium businesses. Introducing Lotus Foundations. Incorporates Nitix, "drop-dead simple". Rhodin shows a yellow server box, small as a notebook. Have server up and running in under a half hour. ISVs can integrate new or existing applications into Foundations. 10:09 AM Not stopping there. Announcing project "Bluehouse", extranet collaboration capabilities, delivered as SaaS, for companies of less than 500 employees. Extend and complement Lotus Foundations. Built from the ground-up that enables cost-effective delivery. Protect data, not exploit for advertising purposes. 10:17 AM Rhodin announces GoPro as best in showcase award. Regional awards: Trilog, Haus Weilgut GmbH, and Blueleaf Corporation. Thank you for reading! Have a great Lotusphere!!! !